In my final year of seminary (Fall 2005), I wrote a paper on collaboration amongst churches and particularly why so little actually happened. In my research, people told me I needed to talk to a man that was making it happen in Atlanta, Chip Sweney of Unite! Since writing that paper, I've had the opportunity to become a part of Unite! and it has changed my ministry and my church forever. 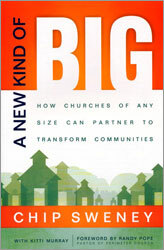 "A New Kind of Big" tells the story of how churches, large and small, have come together to achieve what they can't on their own- community transformation. The book is an easy, quick read with real-world examples and stories. Whether a pastor or lay leader in a small or large church, this book will lead you forward in the Kingdom task that our Lord has given us. Sweney contends that the local church has responsibility for the welfare of its community and leads churches step-by-step through the process of becoming a catalyst for community transformation. Sweney paints the vision for churches coming together as the Body to accomplish a task too large for any one church- taking a city from floundering to flourishing. 1. The emphasis on partnerships. So often a church wants to start and run a ministry by itself. Sweney advocates for the power of working alongside the experts already in the trenches, organizations that know the needs more intimately and have already strategized effective ways to help. It's important to point out that churches shouldn't just dump money and ask for an update every so often. Instead, churches should find a lay champion and engage its people in the ministry. 2. Real ministry is done through relationships: relationships with those in our community, relationships with other churches' leaders, relationships with partners, relationships with the people we serve. 3. The Kingdom call to become an externally-focused church of influence in our city. 4. The concept of "Channels of Cultural Influence" (Chapter 10) - These eight channels- education, health care, business, art and entertainment, media, nonprofits, government, and law/justice- are the playing field for our Kingdom work. By leveraging the members of our churches who are already living and working in these channels, we can increasingly reflect the characteristics of the kingdom of God throughout society and that is when true community transformation takes off.